In Spring I glimpse the year. Some days are cloaked in Winter's frosty chill, and others bask in Summer's skin-tingling warmth or mild Autumn breezes; and then there is the typical Spring day of humid heat with drizzles of both clear sunshine and warm rain. All of these days can be found within Spring's domain. This week has had me reaching for porcelain bowls to ladle luscious, steaming soups into their snow-white bellies. Sometimes a soup may feel a little sylphlike and need a some added heartiness. For me, thick slices of fluffy bread smothered in bubbling golden-edged cheese do just that. cooking time: 1hour & 20mins. taste: 4/5. Great for warming the coldest cockles. I love a hearty soup so I let this simmer down until it became like a drizzling caramel in thickness. The onion bring a savoury sweetness that is mellowed beautifully by the salty, gooey cheese and subtle bread. 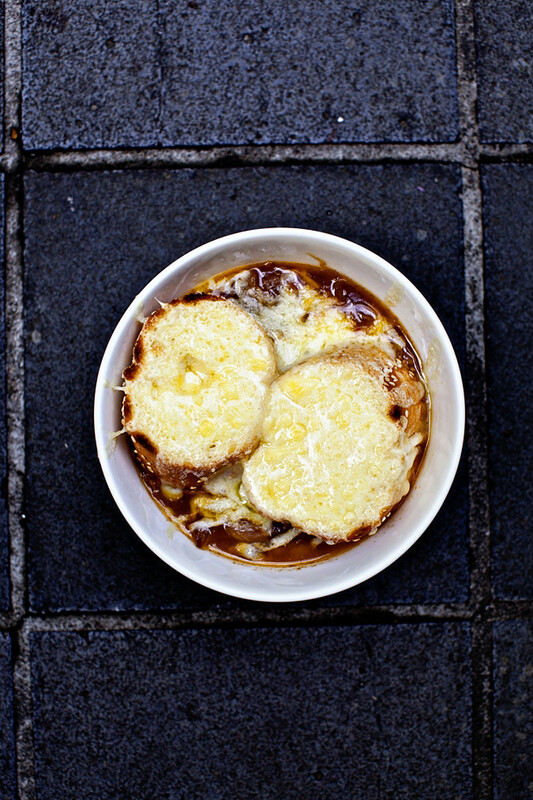 DO NOT skip the cheese toasts, it truly is what harmonises this simple soup. My soup took longer than 20mins to reduce to my desired level of thickness, I also used vegetable stock rather and doubled the butter. The original recipe is linked below. Really scrumptious looking! That soup is perfect when it's cold outside. That looks completely and utterly fabulous. Do want a big bowl of this right now (even though it's about 7am in the morning)! Love that you made this with veggie broth -- I still remember when I realized french onion soup had beef broth -- sad sad day! I'd sure love to see this waiting for me this noon...and topped off with that lovely bread and melted cheese! Wonderful! 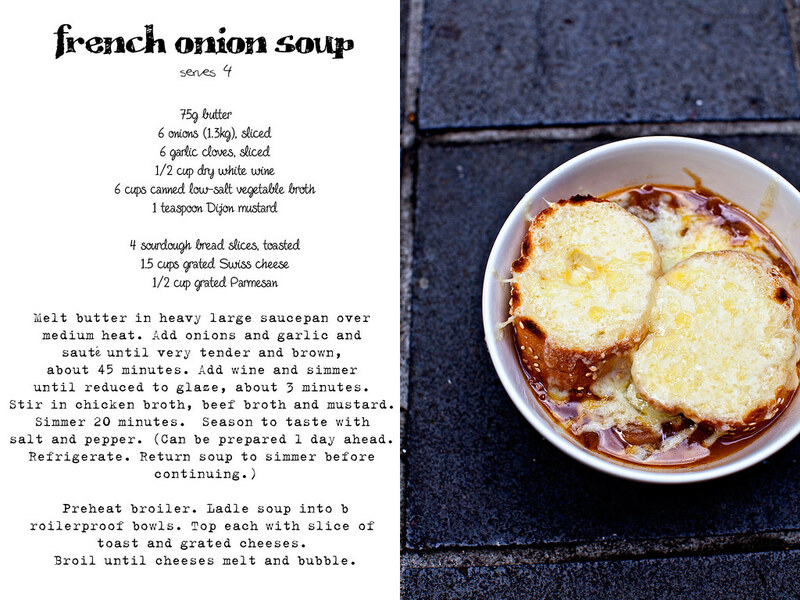 Mmmm, I love french onion soup. I totally agree the longer you let the onions caramelise the better though. And nothing beats a good cheesy crouton. Oh it's such a favourite of mine. Takes me straight back to Paris. Love.